Eagles, Cardinals — perhaps not more fierce than Bears or … more Bears, I suppose. But those are the focus this week in Week 8 of the 2018 Division III football season. Our regular crew is Keith McMillan, Ryan Tipps, Pat Coleman, Adam Turer and Frank Rossi. Our sixth spot each week goes to a guest prognosticator, and this week’s is Logan Hansen. 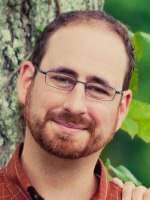 You may remember him as the Wartburg alumnus who does a computer ranking of D-III teams, and he is on twitter at @LogHanRatings. Which game is the Week 8 game of the week? Keith’s take: UW-La Crosse at No. 12 UW-Oshkosh. This should be closer than the rankings suggest, and could upset the playoff apple cart. Ryan’s take: No. 17 Illinois Wesleyan at Washington U. The Bears’ win last week over Wheaton put them on everyone’s radars, and this is another tough test. Pat’s take: No. 17 Illinois Wesleyan at Washington U. I priced out flights to St. Louis for this one. Not in the budget. Adam’s take: UW-La Crosse at No. 12 UW-Oshkosh. Plenty to choose from this week, but this is essentially a WIAC and playoff elimination game. Frank’s take: Hobart at No. 19 RPI. This could have Pool C implications if Hobart wins. RPI’s strength of schedule is excellent and will improve — a 1-loss RPI could win an at-large bid. Logan’s take: No. 17 IWU at Wash U. I’m not sure which result would throw the bigger wrench into the tiebreakers, but Wash. U has shown they belong, and IWU has shown last season wasn’t a fluke. Keith’s take: No. 15 North Central. Carthage pushed UW-O, IWU and Millikin to the brink, so NCC best bring its A game. Ryan’s take: No. 12 UW-Oshkosh. Though Oshkosh is coming off a real quality win, UW-La Crosse has shown more than a few flashes of greatness this fall. Pat’s take: No. 17 Illinois Wesleyan. I look forward to learning if it really is as tough for teams to win in St. Louis as it is for Chicagoland teams in Bloomington. Adam’s take: No. 19 RPI. Hobart and the Engineers have both played their share of nailbiters this season. The Statesmen win another close one. Frank’s take: No. 17 Illinois Wesleyan. 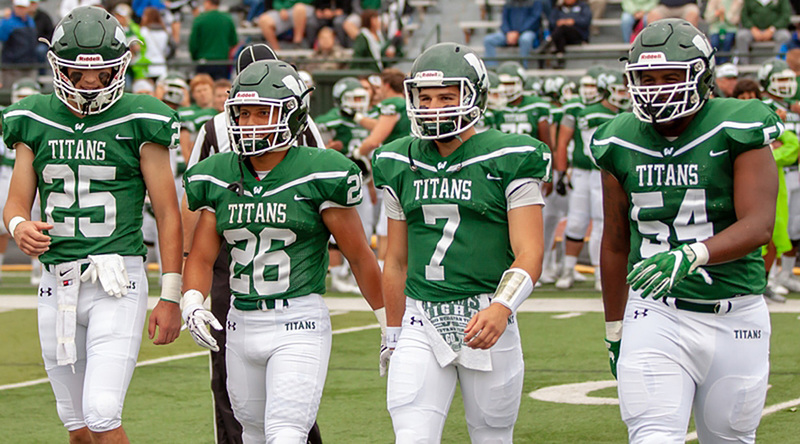 WashU at home, following a win vs. Wheaton … I’ll play the momentum as the Titans have looked mediocre in wins lately. Logan’s take: No. 17 Illinois Wesleyan. The model has Wash. U favored by a field goal, 28-25. Whose unbeaten run comes to an end this week? Keith’s take: Marietta. The Grey Pioneers allow 31.8 points per game, which is way too loose to beat John Carroll. Ryan’s take: Marietta. I expect this one to be a popular pick, as the Pioneers are facing John Carroll this week. Pat’s take: Kalamazoo. Kzoo’s 6-0 isn’t far from Alma’s 1-5, just a different schedule. Similar results vs. Adrian and Albion. Adam’s take: Marietta. The Pioneers travel to No. 10 John Carroll, and leave with their first loss of 2018. Also, RPI. Frank’s take: Western Connecticut. The Bridgewater State Bears have been stalking the frontrunners of the MASCAC — a win would give them a chance for the playoffs. Logan’s take: Central. There’s a reason they haven’t cracked the Top 25 yet, because they haven’t beaten a proven team (except maybe DePauw). Wartburg by a TD according to the model. Keith’s take: FDU-Florham at Misericordia. The former could hit five wins for the first time since 2000; the latter had won five ever before this year & now five straight. Ryan’s take: Hanover at Manchester. I’ve enjoyed watching the Panthers’ resurgence this season. It’s reminiscent to how I remember them from the late ’90s. Pat’s take: Luther at Nebraska Wesleyan. It’s part of my 25-game tour of D3 from west to east from the podcast. Adam’s take: Central at Wartburg. The Dutch could also fall from the ranks of the unbeaten, and the ARC race could turn into a logjam at the top. Frank’s take: No. 2 Mary Hardin-Baylor at Belhaven. UMHB wins, but will the Cru finally resolve their QB contest? Two (let alone, three)-QB systems aren’t optimal, and could be a problem in playoffs. Logan’s take: Emory & Henry at Shenandoah. If I’m picking a random game to watch, it would be this — the model has the spread at -3 Shenandoah, with an O/U of 93.5. Gonna get pointsy. Which team is probably safe to focus more on next week? Keith’s take: Muhlenberg. By the fourth quarter vs. McDaniel, the Mules will allow themselves to ponder Week 9 vs. Johns Hopkins. Ryan’s take: No. 16 Trine. Opponent Finlandia has a long way before it’ll be competitive at Trine’s level. Pat’s take: St. Thomas. Carleton has improved this season but won’t be a match for the Tommies. Adam’s take: Endicott. No coach would approve of this question, but Paul McGonagle’s team faces winless Becker a week before taking on its top CCC competition, Western New England. Frank’s take: Trinity (Conn.). In a topsy-turvy NESCAC race, Bowdoin is winless. Next up would be Middlebury, the team that shocked Williams last weekend. Logan’s take: Muhlenberg and Johns Hopkins. Both teams are greater than 97% favorites this week, and most computer models (not mine) think they’re both Top 10 teams. Who has the edge this week: Cardinals or Eagles? Keith’s take: Eagles. It’s five against seven, and the Eagles have Brockport and UW-La Crosse on their side. Ryan’s take: Eagles. In terms of both quantity and quality (see my upset pick above). Pat’s take: Eagles. But only because of the Golden Eagles of Brockport. Without them, the Cardinals would take it. Adam’s take: Eagles. Thanks to the Golden variety, ranked No. 3 and hosting Buffalo State. Frank’s take: Neither. Cardinals: North Central, St. John Fisher; Eagles: Brockport, Husson. Logan’s take: Eagles. Brockport and Husson basically guaranteed to win. 2.1 expected wins for Cardinals, 2.8 for Eagles. Our Friday podcast is our game day special, the one you listen to when you know to know everything about the upcoming week’s games. Pat and Keith go through a half-dozen big games, then a half-dozen one-liners, and Keith makes six picks at the end to see if he can take them to the house. But on one Division III football campus, there was a lot more going on this week than just preparing for a football game. 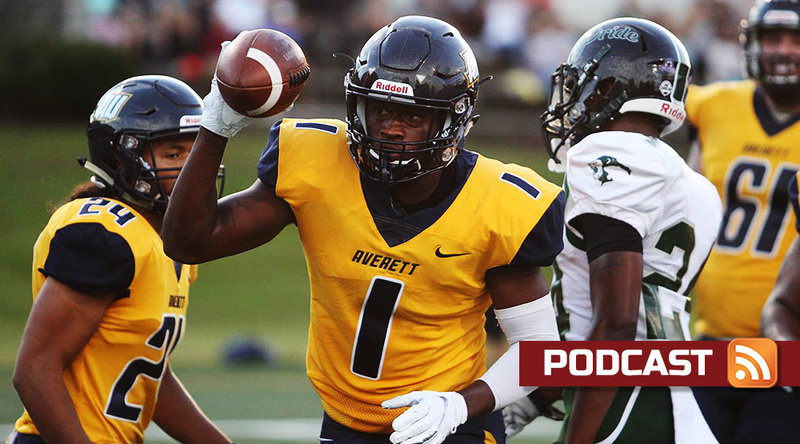 Our guest is Averett coach Cleive Adams, whose team and campus had about six inches of rain dumped on it in very short order this week when the remnants of Hurricane Michael blew through. He tells us about how his team stayed safe and tried to put that aside to prepare to face the USA South’s defending champion, Huntingdon. Plus, Pat makes 25 picks, from west to east, and Keith picks an animal to punch above its weight class. That and more in the latest D3football.com Around the Nation podcast. The D3football.com Around the Nation Podcast is a regular conversation between Pat Coleman and Keith McMillan and guests covering the wide range of Division III football.